[Or do you believe once all the 77As are retired the domestic wide body fleet will be made up of entirely of 764s, supplemented by internationally configured the 78Js and A359s? I don't think the 764 is the 77G replacement at all. The 764s will likely be the last fleet to get Polaris and will be the last United 767s in service 10-15 years from now. Strongest chance they stay international throughout. WINDOWS: I'm not sure if an extra row of Diamond seats would fit in the HD version using space from a closet behind 5K/L and in no lav in front of 1A/B. It might work with a slimmer divider on front of Row 1, which hold video screens. The only other option would be to remove the dividers and have screens come out of the armrests. CENTER: It would definitely take a galley mod in the center section by Row 4 on the HD configuration to match the galley behind 5D/E on the sCO version to get in 5 rows in the center section of the HD aircraft. This probably would see the loss of a row of Y in the center section (4 seats) unless F seats are slid forward by reduction, removal of front divider (video screens) or front galley narrowing. With the galley change and all front dividers reduced, maybe 5 rows across the aircraft could be installed - 30 Seats. The center section could have 5 rows with or w/o loss of 4 Y seats depending on a redesigned divider. Alternative to retain 4 Y seats would be 4 rows in the center section of F - total 28 F seats. Mod costs wouldn't be massive as lavs are not moved, but 2 small galleys would be replaced by a larger galley and dividers replaced/removed in front of F - this could be an issue if jump seats or other equipment are included in those dividers. Obviously a STC would be required. It wouldn't seem to make economic sense unless there was no seat loss - gain from 28 outdated F seats to 30 better quality surplus seats may make the mod worthwhile. Hopefully there would be no loss in Y seat count. If this reconfiguration could be completed, UA could put new life into the 772A fleet for years to come with good lie flat seats on transcon/"ps" service as well as select TATL routes (non-competitive, low F demand, seasonal) and Hawaiian/GUM routes. My guess on the 764 is that Door 2, not on the 763, doesn't match well with the length of Polaris seat sections. So, if the 764 gets Polaris and seating doesn't fit well, they could receive a smaller Polaris section with 2 or 3 rows of Y or PE in front of Door 2. UA has enough variance in route demand to utilize a lower premium 764 on TATL routes. It could compliment standard premium density on 763 and high J 76L aircraft. Without Polaris the 764 could be utilized on Transcon/Hawaiian-West Coast routes and could replace the 772A on theses routes (except GUM and HNL-ORD/IAH/DEN), where the 78X or 772ER may take over at some time in the future. There are enough Diamond 772 seats coming off the sCO 772ER to cover all 19 772As with Diamond seats. The newest sCO units are 2007 (2) & 2010 (2) - it would need half the seats from 1999-2002 build aircraft. Question is if is worth moving lavs and galleys for mostly 1995/96 build units (6 are 2000 build). If UA could get another 10 years out of these aircraft 772As could cover lots of transcons/Hawaii and move the 753 onto hub to hub routes. Of course a split fleet could have Diamond and back/forward lie flat seats, but flexibility would be impacted. After doing a bit of research you are absolutely correct looking at the current seat map for the GE powered 77Es there are 26 seats between door 1L/R and 2L/R. However if they were to refurbish these seats and place them on the 77A's UA could probably get 30 diamond seats in the same space because the LAV located at door 1L and the closet currently located at 5K/L on the GE 77Es are not on the domestic 77As. Also a slight shift with the galleys and LAVs on the 77As would be enough to fit 30 seats upfront and we can finally be rid of all IPTE seating arrangements. Even if UA didn't want to spend money to shift the 2 LAVs and galley behind first class just the fact that there is no LAV taking out 1A/B means UA could still have 28 seats upfront. However I do have a question, if UA does in fact start taking delivery of the A359s in 2022 will we see all 77Es begin their retirement or do you think there is a chance some of these 77Es get a second lease on life within the UA fleet but relegated to domestic service in a domestic configuration? Or do you believe once all the 77As are retired the domestic wide body fleet will be made up of entirely of 764s, supplemented by internationally configured the 78Js and A359s? I think that we'll see the pmCO 77E fleet extended, as they are newer than the pmUA PW 77E's, and have more engine commonality with the 77W's. But I think that affords UA the opportunity to shift the newer PW 77E's into a subfleet, possibly replacing the 77A's, if UA is still interested in that type of fleet. If not, I think they will just make a subfleet of the PW 77E's that are dedicated to certain routes, to maintain parts supply chain, as the fleet is slowly retired. I expect the pmCO GE 77E's to be the last ones at UA eventually. I wonder if UA has the option to slide the mid cabin lav aft a bit on the 737MAX10 to be placed between F and Y on the "ps" type units? Is the mid cabin lav stuck in one position regardless of carrier choice? 737NG lavs are essentially modular, so the mid-cabin lav can be moved forward, aft or eliminated altogether without a great deal of trouble (unlike the old days). That' correct. You may recall that before the cheaper-than-dirt Smisek era, CO had around 20 738s with 20 first class seats and a mid cabin lav just like the 739s. CO used those aircraft primarily on transcon flights, IIRC. You might also recall Gordon Bethune's quote, "You can make a pizza so cheap, no one will eat it." Jeff Smisek seemed to take that as a challenge. Quick announcement, as of today, UA is apparently going to make DirecTV free, not just in F. I assume this is because they are coming up on the start of removal, and they don't want to charge customers for something that will become less reliable, with aircraft swaps. I'm not sure it's related to removal....UA gets a small percentage of revenue from the DTV system. Most of the revenue goes to DTV who paid for the equipment and installation I'm wondering if this is a renegotiation of the contract with UA and if we will see DTV on more aircraft. The 764 is too small as a people mover for trunk routes. I mean, China Southern is able to make PEK-CAN work on an A380 (then again, China has a lot more people compared to the US). I guess it really depends on the price of oil several years from now. If it is sufficiently low, I can forsee the older 777s staying on for longer. If it keeps on rising, then there is a small chance United may order more 78X or A359 Derated for domestic people mover service. ANA operates high-density domestic 787s, while Singapore operates the 787-10 and A359 Derated on their regional <8 hr routes. Unless you have to pee. Speaking of the DirecTV announcement, I flew on N76523 sunday, a 737-800 with DTV still installed and the TVs were turned off the whole flight and the aircraft had Personal Device Entertainment. It seems UA may be keeping the TV's installed and just adding PDE. That seems unlikely. If its free, not only is UA not getting their small piece of revenue, but they would have to be compensating DTV for their portion of revenue. As UA is already paying for both equipment and content for their streaming WiFi entertainment, I can't see them wanting to pay for two services, especially one that adds all that extra weight to the aircraft. 764’s last, do you think current 788/9’s would be refitted before the 764’s? I know market dynamics can change fast in the aviation business- perhaps faster than mods can keep up, or new aircraft delivered and nothing is ever inexpensive to do. That said, transcons are vital to the US economy and being a viable player vs competition is tough. I personally think that the 78-9/10 could be the perfect EWR-SFO/LAX bird because she’s long enough to have multiple classes of service, large PE section too. The reason I think actual Polaris and PE seats are important for EWR-West Coast connections to points across Asia Pacific is a consistent experience. Polaris all the way from EWR and many APAC destinations from the West Coast would/should include Polaris Lounge access too if pax doesn’t terminate at SFO/EWR, and actually works in reverse too, SFO/LAX-EWR to Europe- etc. The expense of buying clearly being a huge concern, but doesn’t UA have more 78-10 options? (Or more 788s) How long would it take to convert an option to delivery? Configured correctly a 787 could be the perfect, fuel efficient and best transcon monster? No? I don't think it matters which would be better on transcons, I don't think that UA has any intention of dedicating any widebodies to P.S. As such, right now, they're using widebodies to supplement the 752's when they have downtime. The 77A's can fit in some turns, in between Hawaiian routes, and 764's could potentially do a turn in between shorter European schedules. The 787's tend to fly longer stages than the 764's, so they stick to shorter domestic hops in between. Obviously, UA can make any plane do what they want, but the 787's are more valuable on longer routes than some other widebodies. Yes. The 788/789 mod program is larger than the 764 (more frames), but it's also going to start sooner (this summer), with no timetable for the 764 just yet. Yes, I totally understand, the truth is right in front of me. But I cannot stop myself from wanting UA to hit its highest notes, even if illogical. I have paid my way in F on UA transcons and I am getting as worn as some of those 752 interiors. But the FA’s try hard to make it special. Recently I was on my first A220 within Europe, and while the F seats were just slimline Y seats with the middle blocked, the newness of the aircraft speaks so loudly about the brand vs old and poorly patched 25 year old aircraft — a conundrum I’m sure HQ is acutely aware of. I would love to be a fly on the wall in one of those planning meetings! Especially if Boeing execs were in the room. Does anyone know if BDL-SFO is coming back seasonally this year? It has been run for a couple years seasonally however picking random dates in June/July I see no non stop flights. Based on my own searching on united.com a few weeks ago, it appears it's not coming back. Instead, IAH-BDL will continue operating through the summer (last year, it was a winter-only route). DEN-BDL also continues as a year-round route. While I completely agree that UA's 757s worn out I'm not sure what Boeing Execs would have to do with the decisions an airline makes regarding the interiors of their products once in the airlines possession. No different than a car manufacturer having any say in how an individual treats their product once purchased by the owner. It does strike me as odd that UA feels its acceptable for their aircraft to operate with interiors in such dilapidated shape. The modern look of the new seat covers is lipstick on a pig for many of their aircraft and it gives the impression UA does not care about their brand, employees or customers. I say employees because it must be at least slightly embarrassing to welcome passengers onboard an aircraft in an obvious state of disrepair. N12567 has exited the fleet. Stored at IGM. Expect N217UA, N228UA and N798UA in about a week. I wasn’t clear why I’d be interested in Boeing execs in the room. I was not about what or how Boeing would help with the deterioration of the old aircraft interiors, it was more about what new aircraft they could offer up and by when, Eg; 797. We know that United has shown a lot of interest, and that as it stands today, the 797 could be the answer for transcontinental and more. Would they discuss UA being the launch customer- and if they are 3,4,5,6 years away from getting bird #1. Then, perhaps UA could put together an interim plan. I think (and in my professional opinion) United is undergoing enormous changes that all point towards a totally new brand, with a legacy name. From what I see, their brand and strategic plan is to become the #1 choice for business travelers in a solid 4 GOLD STAR way (not 5 Stars, but stylish enough) supported by their major business hubs and global and growing domestic routes. My major point is (North Star) Polaris aircraft, Polaris Lounges, PE, new United Clubs and their expansion, beautiful gate areas at their hubs and expanded service, Star Alliance partners along with plenty of brand new sparkling aircraft ARE indeed proof that they are very aware and focused on vastly improving their brand experience. ALL OF THAT is exactly WHY I’m saying that being a real player with a consistent decent transcontinental product vs mix of different aircraft and seats and much of them looking shabby sticks out like a sore thumb in contrast with ALL the other progress they have already made and that we will see far more of this year and next. I think Mr Munoz is being driven to do something great, not just the money (although shareholders can’t be ignored), but being able to step back one day and feel you achieved something. Having United do a 180 turn around from when he got the job would indeed be something BIG to be proud of. Wow... rapidly approaching the halfway point for the 77J/Q fleet! I just saw this update in the system instead of N217UA going to HKG they will ferry position it XMN-SFO as UA2754-03, and it will immediately enter revenue service as UA995-02 SFO-ORD. Also I know N79011 exit from HKG was delayed for maintenance reasons but supposedly now it will exit HKG with Polaris and ferry HKG-EWR as UA2746-04. We will see this holds or incurs another delay. Aircraft N79011 was not delayed for maintenance reasons it was/is delayed (grounded) until the FAA gives UA STC. The test hop which took place on 1/26/19 was successful however; do to the government shutdown the FAA hasn't worked through the backlog of paperwork. If the FAA gets through all the paperwork signs off on it UA will have STC and can ferry aircraft N79011 HKG-EWR as UA2746-04. If the FAA is still processing the paperwork then that flight will be scrubbed as well. So for now N79011 although it is ready and has Polaris installed is stuck on the ground at HKG awaiting FAA STC. I am assuming the STC bird for the 76L configuration will be similarly delayed. Hopefully the FAA can clear the backlog quickly! Any update on the 763’s in for Polaris mod since Nov/December? Excluding the Ex-Hawaiian bird of course. The other 2 should be about ready, no? N660UA should emerge this month, completing the 76A program. The other 763s await approval of the 76L STC, which could be delayed somewhat as a lingering effect of the government shutdown. Only 6 ex CO 777s are newer than the newest UA 777s and some are merely by a few months or weeks. The rest are the same age or older. United has DTV on the S-CO airplanes but I doubt they will get it fleet wide especially on the S-UA airplanes. That may be, but UA had 18 77E's before CO got their first. So that's 15 remaining sUA 77E's delivered in the same years as sCO's 77E's. I would also wager that UA's have more cycles than the CO's. 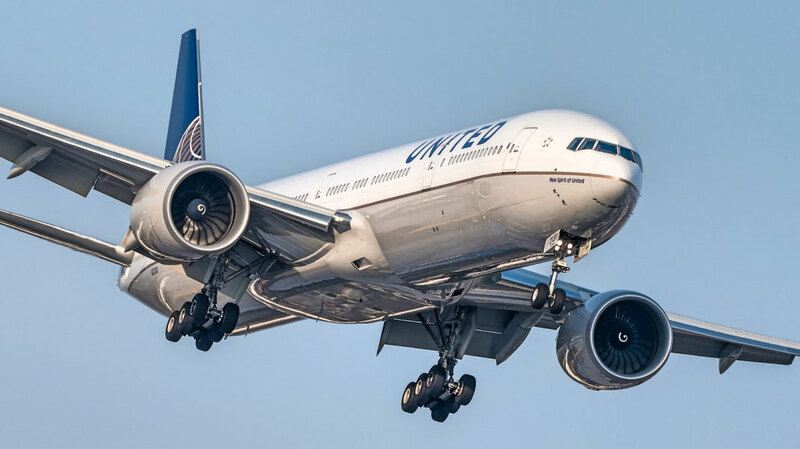 The truth is, it will come down to exactly when they decide to downsize 777 fleets, which are running up on C/D checks, and whether UA would ultimately like a smaller 772 fleet of closer to 22 or 33. Because I think they will reduce to one or the other for engine consistency. But either way, the sCO will probably have more in common with the 77W fleet, so I think that gives it the edge. I don't believe the ex-HA bird has even begun Polaris outfit yet. It spent a couple of weeks getting other maintenance done (bringing up to par with the rest of the United fleet) and then was pulled out to make room for 660. Once 660 comes out, it should go back in and begin Polaris cabin fit. I'm still thinking UA will fit HA units with the 85 Y seats released from each 2 class units to 76L reconfiguration. That would mean N660UA and the next 2 class into HLG can provide Y seats for N684UA. I passed through IAH yesterday and I saw a 763 parked in front of the hangar near N Terminal Road / East Bridge that was looking pretty tired. The green undercoating was showing through the paint in several locations along the top of the fuselage. There were a good 6-10 feet of paint peeled off in one section over the wings. There was so much paint missing I almost wondered if it was intentional, maybe the first step in the repaint process. However, I personally believe that once UA has a 100% consistent Polaris LHR flights, 787-10 and others, like High Premium 767s, maybe even 77Ws, that a NYC style ad blitz in both cities wouldn’t hurt. Some claims like that will work for those people who find that message relevant to their flying life. How many 76L’s will United create? Unfortunately its not exclusive to this 763, it's becoming a larger issue across the fleet. I've seen a number of very tired looking 737s and 777s lately. That said, there is a paint campaign underway right now so hopefully the tired ones are taken care of quickly and the others don't get too much worse before they get a new paint job. N79011 - Scheduled to exit HKG on 4-Feb/2746. Seat map, etc. has not been updated yet but this should be the first GE 777 with Polaris. No GE or PW 777 entries into HKG or XMN scheduled to replace all of the aircraft exiting over the past few days. Seems like I've read that there are several UA aircraft that have had paint failures and are due for repaints under warranty. I'd guess that they probably won't wait for a new brand campaign. Not exactly sure where you are getting your information from but it is inaccurate. N229UA is already at XMN it arrived about 24 hours ago for Polaris installation. Within a week or two N228UA and N789UA are expected at XMN for Polaris installation. As far as the GE powered 77Es N78013 has been in HKG since January 17, 2019, I'm not 100% sure it is there for Polaris installation I'm still trying to get confirmation. However I do know before N79011 departure was delayed do to the government shut down N76010 was tentatively scheduled to ferry to HKG for Polaris. Once UA has STC approval for N79011 I fully expect another GE powered 77E will go to HKG for Polaris. Peeling paint doesn’t mean a plane is “tired” it’s just peeling paint, which happens to be a United tradition. Agreed. I was recently on one of the A320s just acquired from China. The paint on the right winglet was already peeling off. I notice that the website below has been showing N228UA and N798UA as being in mods for Polaris installation already. N228UA arrived at XMN on 17th December last year, and N798UA also arrived at XMN on 1st January this year. However the site hasn't been updated to show N229UA is also at XMN. Why does this conflict with your ETA for N228UA and N798UA at "XMN within a week or two", if they have already been there for 7 weeks and 5 weeks respectively? N2243U sked to exit SFO 869/5Feb with PE, seat maps not shown yet. Don't see inbound mod unit. Thanks for catching the fact that I didn't update N229UA in Polaris Update spreadsheet (corrected now). Does anyone have an idea of what's taking the last 3 753 slimline mods so long? Maybe the holidays, but N57852 and 57855 have been in MIA since 12/19/19 and N74856 has been in SAT since 12/26. and a seconded GE powered 77E tail number N78013 is already at HKG for Polaris. Will check again, but believe 0013 is just in for a MX check, not seeing Polaris scheduled. Could be because of 0011 not having the STC approved yet. Polaris might be added to 0013, but 0013 is scheduled out with a ETR on the 16th. Because I think they will reduce to one or the other for engine consistency. But either way, the sCO will probably have more in common with the 77W fleet, so I think that gives it the edge. Engines could be a big reason, but more likely performance. Same with the 757s, except the engines are pretty much the same -535s Phase II/ Phase V Rolls on the -224s and -300s, interchangeable. Big plus. Phase V has the painted swirl on the spinner, easiest difference to see visually..
Airbus narrow body fleet talk. N57855: parts issues, #8 slat sent to SFO for repairs, no release date yet. When I made my comment, I excluded the ones that were already in for modifications, I was purely looking forward. My information is only from public sources, anyone with inside information will have more accurate information than I will. I am sure UA is already all over this!